Rawl'kha is a city in central Reaper's March. The most significant building in the city is the Temple of the Two-Moons Dance, one of the holiest places for the Khajiiti, since it was there that Mane Rid-Thar-ri'Datta revealed the Riddle'Thar Epiphany, a key event which will stablish a united Elsweyr state under the Manes rulership with the Lunar Clergy support. Since then, the city have played an essential role in the ascension of each new Mane. Besides the proper city temple, the settlement has two more moon shrines: a chapel to the north and a temple-attached stupa to the south. Many pilgrims, included clanmothers, the candidates to be ascended to Mane and other notables Khajiiti visit Rawl'kha to assist to the various religious ceremonies which are performed in this holy city. Although there is no clanmother ruling the settlement, law is effective and implacable with criminals, as its stocks show to both citizens and outsiders. In absence of a noble-based government, the Lunar Clergy oversees most of the issues in the city. Therefore, the keeper of the Two-Moons Dance Temple, Kauzanabi-jo, may be called the de facto ruler of Rawl'kha. But it is not all about religion in this city. Due to its privileged situation between Dune and northern Valenwood, and built upon a tributary of the Strid, Rawl'kha plays a key role in the March's trade. Many caravans stop here before crossing the dry savvanah. To assist all this flow of goods and gold through Rawl'kha, the city has three markets: The greater March Bazaar in the interior of the settlement and the Moonlight and Outskirts ones for caravanners. 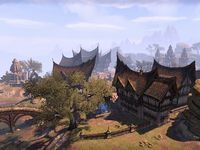 Except for the houses of worship of the city, which are built on ancient Anequinan style, all the other buildings are contructed in Khajiit-style and made from wood, like in all of northern Elsweyr. Due to the Colovian invasion of Arenthia, the city has received recently many refugees, specially Bosmer ones, from that city. The Vinedusk Rangers have stablished a camp outside the city for the same reason, after its headquarters were besieged by the Legion of the West Weald. The warm hospitality of the Rawl'kha Khajiiti have even surprised them, since Khajiiti and Bosmer were enemies not long ago, but it seems that no one of those refugees miss their homes. Rawl'kha Objective: Help the Lunar Champion begin a spiritual journey. 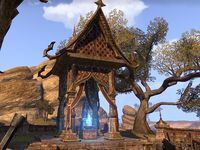 Rawl'kha Wayshrine is located in the southwest of the city, between the bank and Moonlight Market.